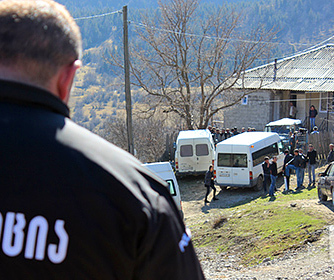 TBILISI, DFWatch–The Ministry of Internal Affairs (MIA) has launched an investigation into the religious conflict in Adigeni in southern Georgia, where Muslims and Christians disagree about whether to have a separate graveyard for Muslims. The investigation is launched under article 156 of the Criminal Code about persecuting a person on the basis of opinions, beliefs or religion. Samkhretis Karibche, a local media outlet based in Akhaltsikhe, reports that a group of Christians is gathered at a house in Adigeni and Muslims in another house, with police in the middle. Representatives of the municipality are also in the village attempting to make the parties negotiate. According to Sknews, Muslims from neighbor villages like Apieti, Tsikhisubani, Dertseli and Mokhe, places that had their share of religious conflict last year, arrived in Adigeni. Muslims gathered at the house of Avtandil Iakobidze, who was injured during a clash on Monday. A group of about 20-30 Christians attacked Muslims gathered in the center of Adigeni, according to Education and Monitoring Center. The Muslims were discussing cemetery arrangements. Three Muslims were injured. They have facial and head injuries. EMC reported that Christians engaged in hate speech and the police was too late to stop the clash. Sknews writes that the gamgebeli of Adigeni, Zakaria Endeladze, who is also present in the village, assures that the conflict is over and they have reached an agreement. He said that he spoke with both communities, and suggested selecting three persons to participate in the negotiations. For several months, the Muslims in Adigeni have asked for a location for a separate cemetery, as it is violation of religious rules to bury them on a Christian cemetery. Currently they have to bury people in the village Zanavi. The government Agency for Religious Affairs gave a positive recommendation to their request and asked the local municipality to carry out the decision. When Muslims discussed this with the local municipality on Monday, Christians came there to resist.